The Recollect seed -which arrived in America in the Missionaries’ luggage- sprouted in Colombia in the shade of La Virgen de la Candelaria. Towards the end of the 16th century, Fr. Mateo Delgado (1526-1631) made contact with several Hermits who had just finished building -in an isolated spot- a hermitage to La Virgen de la Candelaria. He advised them to seek the support of the Superiors of his Order with a view to more easily assuring their survival by converting the hermitage into a monastery. He further suggested that they might consider adopting, in their monastery, the Recollect observance. The Desert of the Candelaria, Ráquira, Colombia. On the 12th of August 1604 a delegate of the Province took possession of the hermitage. He placed the habit on the first three aspirants and appointed Fr. Mateo as the Superior. Their way of life was made legislation in a brief code of conduct, all of which was put together using materials from the Recollect movement. In a short time the walls of the Candelaria proved too small to accommodate all those who wished to embrace the Recollect ideal. In 1606 one of their first Novices -Father Alonso de la Cruz- accompanied the Provincial in the foundation of a second convent in Cartagena. Six years later the third emerged in the city of Panama. 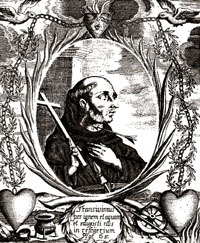 Alonso de la Cruz, Martyr of Urabá, Colombia. Life in these convents was very hectic. Between 1630 and 1651 they changes ownership five times, passing from the hands of the Calzados to the Recollects and vice versa until the Calzados renounced all rights which they may have held over them. Throughout this struggle, the Colombian Recollects looked constantly for the help of the Spanish - with whom they felt themselves identified. In 1629 they incorporated themselves into the Spanish Recollection; although their definitive affiliation only became firmly established after the struggle had ended. The fight for survival didn’t deplete their energies. 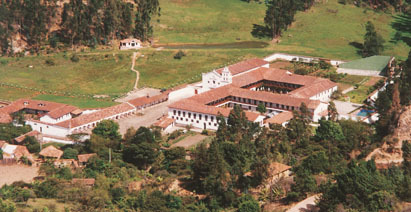 In 1635 they constructed fabricated houses in both Bogotá and Tunja, arriving shortly after in Cartago and Honda - a river port over the Magdalena –, which was to be the finest meeting point between their Caribbean convents and those of the central plateaux. Other foundations in Columbia, Ecuador, Venezuela and Panama didn't achieve consolidation. Efforts to establish the Recollection in Lima and Misque (Bolivia) were more successful, where, in 1617 and 1623 Recollect foundations sprang up. For two centuries Colombian Recollects lived a serene life, without significant highs or lows. There were normally around one hundred Religious who alternated between monastic retreat and apostolic activity. They participated in the popular missions, and their convents possessed well-attended churches. Between 1626 and 1638 they lead a splendid missionary enterprise among the native peoples of Urabá and Darién. The mission of Urabá ended in 1632 with the violent death of three Religious. Later they worked in Chocó on the Caribbean Island of Catalina, on the mouth of the Oranoco and in Casanare where they arrived in 1662.